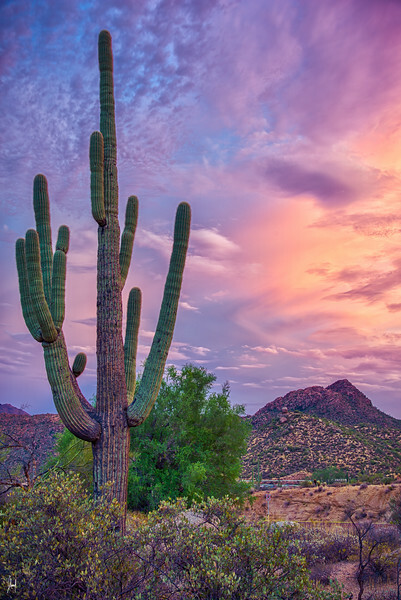 I adore living in the southwest! I am a Michigan native, so I can’t complain about the almost non-existent winters here; but the true joy of the southwest is the scenery. The forested mountains, rivers, canyons and mesas of this beautiful land are simply enchanting to me and we have more beautiful sunsets than duds. However, the truly special things about the southwest are the cacti. There’s something so unique and special about them and, with an amazing sunset as a backdrop, they make amazing foregrounds! This shot was captured with a five-shot exposure bracket. The resulting images where then merged together as an HDR, but I kept the tones flat to preserve the natural colors in the image. The final result is brilliantly colorful but true to how I experienced the sunset in person.